Scott is the Manager of Building Operations at Carleton University in Ottawa, Canada’s Capital City. He graduated from Carleton University with a degree in Environmental Engineering. Before joining the University, he worked for a residential and commercial developer creating efficient, high performing buildings from an energy, water, and building environment perspective. Building automation systems (BAS) or direct digital control (DDC) systems have been used in all building types throughout the last few decades to control and monitor mechanical and electrical equipment such as heating, ventilation and air conditioning (HVAC) systems. BAS are also important tools to troubleshoot issues related to HVAC and building systems, ensure that building comfort levels are maintained, and minimize energy consumption. When properly designed, maintained and operated, a BAS will deliver stable control and smooth operation for campus facilities. Over time, BAS have evolved to not only monitor indoor environmental quality, but to also include other building systems such as lighting and access control, closed circuit television (CCTV), lab air flow/fume hood ventilation, and utility metering. To fully capture the comprehensive application of this campus system, it will be referred to as an energy management and control system (EMCS). This chapter will specifically look at operating an EMCS in the context of a central campus such as a university or college facility. Various types of control systems have been used in facilities operations since the 1800s. Originally, these systems employed pneumatic or electrical controls that allowed mechanical equipment to be remotely started and space conditions to be monitored. As building systems grew and centralized systems were used to regulate environmental conditions, additional building controls were introduced to satisfy occupants. These included individual thermostats for offices and meeting rooms and humidistats on centralized air handling equipment. As computers became more advanced and costs to manufacture were decreased, it became apparent that computerized (direct digital) controls were the most effective choice for building operators. DDC systems allowed operators to control HVAC devices using microprocessors. These microprocessors receive signals from analog and digital inputs from the sensors and accordingly respond to the control logic, or sequence of operations and provide an analog or digital output to the controlled HVAC device. As building HVAC technology has advanced over the last few decades, the ultimate goal of providing an acceptable conditioned environment where air temperature, ventilation rates, humidity, noise, and lighting can be maintained within reasonable parameters remains the same. However, despite HVAC advances over the years, the largest concern raised by occupants is that they are too hot or too cold. As people are different and have varied susceptibility to air temperature, ventilation rates, etc., this problem will never be totally eliminated. ASHRAE, the American Society of Heating, Refrigeration and Air Conditioning Engineers, publishes and maintains a standard on thermal comfort and notes that even when the building is operating as designed , you will only please up to 90 percent of occupants. Stated another way, even when you have the most optimized conditions in your building, you should still expect that a minimum of 10 percent of occupants will express concerns about the temperature. A well maintained EMCS lays a foundation for optimized comfort control. An EMCS also monitors parameters that can lead to poor thermal comfort, and as these parameters deviate from the set points, alerts can be set to ensure building operators can take corrective action before occupants complain. Some of the parameters monitored are building humidity, carbon dioxide levels, supply and return air temperature, etc. An EMCS will not be able to respond to metabolic rate deviations of occupants, clothing choices, noise, internally generated conditions, etc. 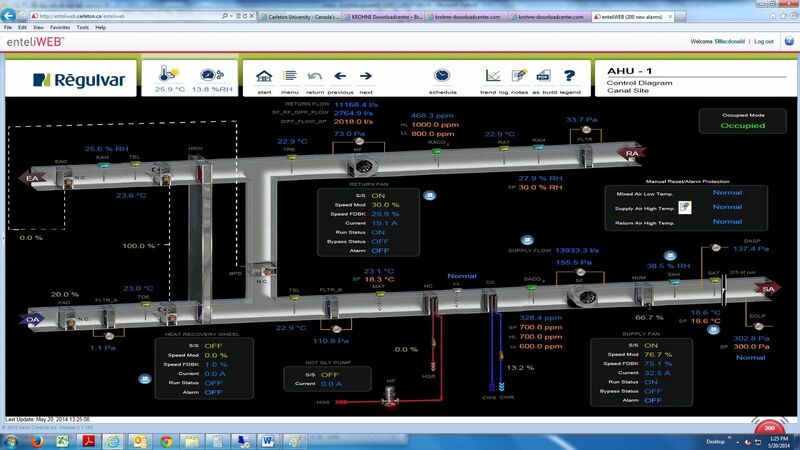 Most EMCS systems have a graphical interface that allows building operators to interact with the building and view operating parameters throughout the building, both at a system level, through monitoring of boilers, chillers, and air handling units, and at a local level, through monitoring of space temperature, relative humidity, and carbon dioxide levels. Figures 1 and 2 demonstrate a typical graphical interface from a building EMCS. Another important role for an EMCS is the management of energy consumption. This is where control sequences are implemented, adjusted, and maintained to minimize potential issues such as simultaneously operating heating and cooling sequences, ensuring equipment is only operating when intended, and that the proper mixed air ratio is maintained to minimize conditioning costs. The EMCS can be effectively used to ensure the required ventilation requirements are met and minimize energy consumption within the building while still maintaining the desired indoor environment. Some common strategies include resetting the discharge air temperature based on outdoor air temperature, resetting the system static air pressure based on feedback from the air terminal units to reduce the fan speed, etc. An effectively operated EMCS system can also provide information to monitor the implementation of sustainability initiatives within buildings. As discussed above, energy use can be managed but also other metrics such as real-time water usage, carbon footprints, lighting usage, etc., can be collected and analyzed. These metrics can then be compared to the design or sustainability targets for the building to evaluate how well the building is performing. An effectively operated EMCS also helps fulfill the measurement and verification requirements for green building rating systems. As most of the green building rating systems award additional points or credits for formalized energy conservation, the EMCS plays a critical role. In North America the most common rating systems are Leadership in Energy and Environmental Design (LEED), Green Globes, and BOMA BESt (Building Owners and Managers Association building environmental standards). The comprehensive collection of data and access to graphical interfaces depicting how buildings are operating can reduce the amount of time spent to visit each building to evaluate the building’s operational issues. Building operations staff are able to remotely view how a building is operating and can effectively navigate through graphics that can display various mechanical systems within the building. This enables the operators to diagnose a potential problem and view the status of components of the systems without needing to actually visit the site. Most security and life safety systems are stand-alone systems that provide monitoring for their designated purpose. However, if this information was to be shared with an EMCS, numerous benefits could be realized. Smoke control systems. An EMCS can be utilized to receive data from a fire alarm system as part of an engineered smoke control system. As the air-handling units, return and exhaust fans, and damper positioning are already controlled by the EMCS, this information can be transmitted using controllers to a fire control panel to alert first responders where a possible fire is located in the building. Now first responders can make effective decisions to manually override supply/exhaust fans and damper positions as they see fit. Lighting control can be used to augment both fire and security functions. In a fire emergency, the paths of egress and all involved zones can have their lights energized regardless of occupancy status. At night, in the unoccupied mode, a building may be in the minimum lighting level mode. When a security breach is detected, the affected area may be lit up and in some cases, lights flashed to startle intruders and attract security personnel’s attention to the affected areas. In creative exterior LED lighting applications, color coding may further indicate a building’s status to observers (a building lit up with red lights at night indicates an alarm condition). Using occupancy detection for multiple purposes is another great example of leveraging technologies. A single motion detector may trigger lighting and ventilation control. It may also trigger security alarms when appropriate. As universities/colleges investigate the types of systems to implement on their campus, there are many decisions to be made. Many systems are implemented on a turnkey basis from a local representative of a control system manufacturer. However, other options exist, such as contracting for the design and installation of the EMCS with a controls integration contractor or implementing the design and installation with in-house staff. Universities, as large customers, may enter into long-term business relationships that allow for the purchase of EMCS components at an established pricing strategy for service and expansion of the system, technical services to assist building operators in the implementation of the BAS, and other packages in which the system integrator provides the parts and engineering for a particular project, while the university owner or an approved contractor performs the installation. The key issue to be aware of is that whatever EMCS that you select for your site will involve the establishment and maintenance of a long-term involvement by the manufacturer(s). Energy Management and Control Systems (EMCS) come with a wide range of features and capabilities. Some may be as simple as networked thermostats, while others offer complete solutions including enterprise-wide access and data-sharing. Most systems can offer stand-alone capabilities with no user interface (no PC or web access), but that is not a common solution for the higher education market or owners of large facilities. Universities and colleges have a wide range of occupancy needs on a campus and their EMCS needs to be flexible enough to handle everything from simple applications like student housing to more complex applications such as classroom buildings, central plants, science labs, and research facilities. Controller: the object that receives the variable data from the sensor compares to a set point, performs the prescribed logic, and further generates a control signal that is in turn sent to the controlled device. Controlled device: the component of the system that receives the signal from the controller and adjusts the process accordingly. Feedback: the device under control responds back that it is operating in the desired manner. It has no effect on what the variable is. Process: the act of all of the sensors, controllers, and devices working in sequence to control an operating parameter or system. Sensor: used for measuring variables. A signal sends an output to a controller, either binary (discrete) or analog (continuous). Examples include temperature sensors, pressure sensors, etc. Set point: the desired value of the variable. Variable: the parameter being measured and controlled. Examples are space temperature, humidity, airflow, etc. Different types of control loops exist, both open and closed loops. An open-loop control does not receive any feedback to the controller from the variable being controlled. It is the simplest and often the lowest cost option to install and is used only where direct feedback is not needed. An example of this type of loop would be a boiler reset schedule. The boiler hot water temperature would be reset based on the outdoor air temperature to adjust the water being delivered to the space and not based on the space temperature at all. A closed-loop control does receive feedback from the variable being controlled and uses that information to further adjust the device being controlled. Closed-loop controls can provide better control and are more often implemented. An example of a closed-loop would be where a desired set point needs to be maintained. The sensor in the space would measure the temperature and send the information to the controller; the controller would then compare the set point to that measured value and send the appropriate output signal to the valve being controlled. The valve would respond accordingly either allowing more water to pass through a coil or less. This change would then change the supply air temperature to the space and the sensor would detect any change and repeat the cycle. There are several other control concepts that are described below (the figures and text below were taken from the Building Control System chapter in the BOK.) These actions listed below are by no means exhaustive, but do illustrate some of the more common strategies employed. It is important to note that the EMCS is only a tool in an operator’s toolbox and needs to be properly maintained to ensure that the building systems are operating in the most efficient and economical fashion. Constant tuning and calibration of the control loops is a very important task for building technicians and operators. As previously noted, control loops consist of sensors, a control program and a control signal. The EMCS relies on these loops as they are the foundation to operating buildings with the greatest efficiency. If sensors are not calibrated, temperature or pressure readings can vary on either side of the desired set point. These improper calibrations could cause loops to cycle several times a minute, causing excessive wear on valves and dampers. In addition, systems can waste tremendous amounts of energy when heating and cooling coils cycle on and off in front of each other, which is a frequent occurrence in many systems. Poorly calibrated sensors which can lead to overcooling or overheating result in various systems fighting against each other. Tuning of loops can be a manual exercise that requires the technician to manually observe how the system responds when values are changed, which can be quite time consuming. Self-tuning digital controllers have been developed that eliminate most of the effort and time required with manual tuning. These newer controllers contain loop-tuning software either in firmware or in software applied externally to automatically bump loop output and measure system response. After measuring the response, the controller calculates the proper PID gains for the loop. The new gains are then either displayed for the technician to enter manually or they are automatically entered into the control program. Self-tuning controllers can increase the accuracy and stability of a control loop to the point at which a coil discharge temperature can be controlled within less than 1°C for a period of several months or more in some cases. Although this is rarely needed in most HVAC systems, the ability to automatically adjust set points for optimal efficiency and to be assured that the system will in fact go to and hold the new setting is very important. The operational challenges identified above are a few of the challenges that could affect an EMCS, and it highlights the need of having properly trained technicians to respond and repair the system regardless of age or type. As facilities age, the need to update older control systems is necessary, as products from the original installation become obsolete, replacement products may not exist, support from manufacturers can be eliminated, and operating staff may not have the resources to maintain the outdated control system. To effectively replace an outdated EMCS, a logical strategy needs to be established. The strategy should document what needs to be monitored (HVAC systems, utility metering, CCTV, fire alarms, elevating devices, etc.) and how the system will be structured to promote the goal of achieving the required indoor environmental quality with the least amount of energy. Before considering the development or expansion of your EMCS, it is important that a detailed specification of requirements be developed, which generally revolves around providing a comfortable indoor environment for the occupants, while maintaining efficient operation of each building on campus. Having a comprehensive specification ensures that consistent equipment installation practices and building control strategies are used to ensure that appropriate operating and energy management techniques are utilized across the campus. When developing the specification, it is important to facilitate feedback from all the groups that contribute to the design operation and maintenance of the controls network, to ensure all aspects of the future development and operations are dealt with. The development of specifications for an EMCS have become more challenging as a result of the addition of “intelligent building” control. Although EMCSs have been around for decades, the development of intelligent building strategies for intelligent operations and effective energy management strategies can be a challenging task for the design teams and building operators. When enhanced operational strategies are proposed, there can be resistance to the change, however, these enhanced strategies can improve the effectiveness of the operation and/or troubleshooting. Proper training, documentation, and testing can greatly improve the success of the enhanced strategies. Outlined below are some energy conservation strategies that should be reviewed and considered for specifications to create a baseline for effective EMCS operation. Many older pneumatic control systems operated with set points set in the same place for the life of the system. Set points were typically chosen by the design engineer to meet maximum design conditions, which occur only a few days per year. Because of their limited communications capabilities, pneumatic controllers had little knowledge of what the other controllers were doing. It was impossible to set up global control strategies or to really optimize set points within an air handler, much less a building. Unfortunately, many potentially powerful EMC systems are still being designed and operated in much the same way as these older systems with fixed settings or minimal adjustment based on one isolated variable (e.g., outside air temperature). EMC systems with improved communication and flexible software capabilities should be used to optimize overall system efficiency. A simple energy optimization technique to implement is to increase the supply air temperature set point during the winter to the lowest value that still is comfortable to building occupants. Although this strategy may be cost-effective from an energy perspective, it would potentially yield unfavorable conditions for building occupants. Another strategy would be to change the set point throughout the day to ensure that the peak load is shifted when energy costs are potentially higher. This is known as preconditioning the space and uses the existing building thermal mass to “store” heating/cooling. This method requires an optimal sequence of set points that can be cycled throughout the day based on a variety of variables. This can be accomplished by collecting data from all of the sensors on the units, such as return air temperature, which is generally a good indicator of average space temperature. Other variables that can be monitored are the outdoor air temperature, the mixed air temperature, and various space temperatures. With information from the sensors and building prediction algorithms, you can predict over time what the building temperature will be in a certain zone. Weather forecasts can be utilized as well to improve the accuracy of the model and ensure that the set point is optimized based on all data and machine learning techniques based on statistical methods. The most basic and effective energy savings result from turning off energy-consuming systems when they are not needed. All EMC systems have applications for scheduling the start-up and shutdown of building equipment. Modern time-of-day scheduling programs allow operators to create numerous time schedules based on weekly, monthly, and 365-day calendars. Many systems include an actual annual calendar showing the months for several years, onto which control points can be assigned. Many have features that allow groups of commonly controlled equipment to be assembled as one schedule to simplify rescheduling, if necessary. An important feature is the temporary override feature. This allows the system operator or a technician at a field panel to enter the override to an existing schedule for a piece of equipment. Overrides can usually be entered any time prior to an event and will erase after the event has occurred. For example, say an air handling unit for an auditorium is scheduled to go off automatically at 10:00 p.m. Monday through Friday. However, next Tuesday a lecture is being held that will last until 11:00 p.m. A temporary override is entered to keep the unit on until 11:30 p.m. that night. Afterward the system will go back to the regular Tuesday schedule. Most systems allow operators to change time-of-day programs both at operators' consoles and at field controllers. Scheduling from both these locations requires some coordination and good communication. Programs created at the console must be downloaded to controllers where the control points reside, and schedule changes made at the field controller must be saved to the operator's console hard disk if system schedules are to be accurately maintained. Because it is easy to forget changes even hours after they are made, many systems have automatic upload capability or at least allow the console operator to review any changes made at the equipment room level. One of the most common EMC system energy-savings applications is called optimum start-stop. 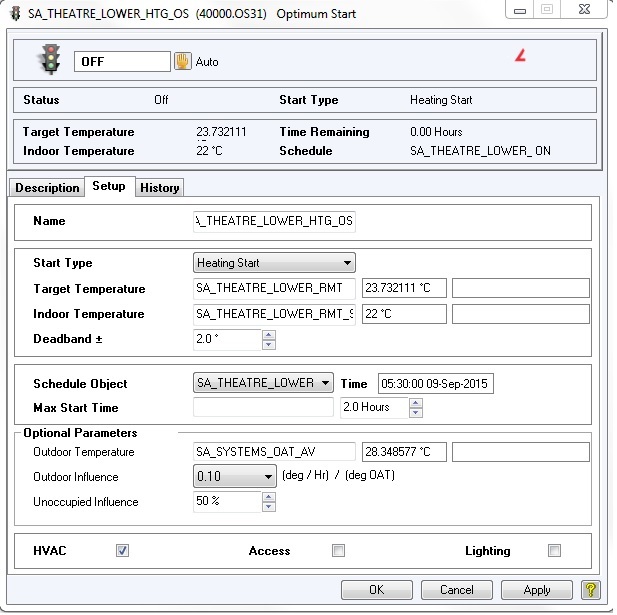 In its simplest form, this program uses outside and inside air temperature sensors and a predictive algorithm to calculate the start lead time necessary to bring a building space to its normal operating set point before scheduled occupancy. There are several variations, including having the operator or technician help the system by entering "constants" that are adjusted until the HVAC system starts, with enough lead time to adequately heat or cool the space. Here the constant represents the thermal inertia of building mass, a factor that has been historically difficult for most controllers to learn on their own. More advanced systems use an adaptive program to calculate the rate of heat-up or cool-down and a prediction based on curve-fitting techniques. It then adjusts its start-and-stop multipliers as it learns the thermal response. Some vendors take a more simplified approach and build look-up tables that relate various outside air and interior temperatures collected over the preceding several days or weeks. Because these programs are complex and prone to errors, they must be carefully tested prior to final acceptance. The best way to do this is to set up a multipoint trend log that records space temperature, fan start time, outside temperature, and before and after occupancy time. These logs must be run until the manager is satisfied that the optimum start programs for each HVAC unit work properly. Once a program works, then only during preventive maintenance inspections should technicians be required to review optimum start trend logs and verify proper operation of these programs. Another EMC system application program commonly applied to air handling units is the enthalpy economizer cycle. This program is designed to measure the total heat content of both the return air and outside air temperature entering the air handling unit. To reduce the mechanical cooling requirements of a system, the controller must determine which airstream is the coolest in terms of total enthalpy (latent and sensible heat content of the air). If the outside enthalpy is lower than that of the return, then the controller opens the maximum outside air damper, and the cooler source of air is used. National Weather Service showing the average outside air temperatures and relative humidity and number of hours per year they occur. These charts make evaluating the potential savings much easier, but as many locations experience only limited conditions in which both the temperature and the humidity are useful, caution and great care should be taken when specifying and installing this application. Like the other digital control applications, each enthalpy control program should be thoroughly tested and evaluated. Trend logs should record outside and return air temperatures, humidity, and the outside and return air-damper control points for each air handling unit. During HVAC system preventive maintenance, mechanics and technicians should be trained to review these logs (especially during the spring and fall months) to verify correct operation. Because of the narrow band of joules (Js) per kilogram/ British thermal units (BTUs) per pound that occurs between outside and return air enthalpy and the inherent accuracy problems with humidity sensors, can occur in these applications. Many technicians have observed dampers operating completely in reverse, bringing in 100 percent of the hottest, most humid air possible. Enthalpy programs can be worthwhile, but managers cannot be too careful when applying or maintaining these control applications. Lighting is the single largest user of electric power in most campus buildings. Depending on the building, this can represent 50 to 75 percent of all electric usage. Lighting also contributes a significant heat load for air conditioning. If applied and then managed correctly, central monitoring and control system/direct digital control (CMCS/DDC) lighting control can save 20 to 30 percent of this power. The addition of just a few extra points on the digital controller has proven to be an excellent way of reducing electrical and air conditioning costs. Used with permission from Creston. Daylight harvesting is another useful technique to limit the amount of artificial light needed when there is sufficient daylighting. Typical installations incorporate perimeter lighting with a photocell to ensure there is always sufficient light in a space regardless of the source. The trend toward digital control at the room level has been steadily gaining momentum and has virtually eliminated the use of the pneumatic room thermostats in new construction. Room DDC controls add a new dimension to building operational information and control. With room DDC control, a small microprocessor-based controller is located at the room terminal device (VAV box, fan coil unit ventilator, etc.). Sensors are installed to measure room temperature. Analog and digital outputs are provided to control damper actuators, heating and cooling control valves, relays for electric heat, fans, heat pumps, and single zone air handling unit controllers. Because terminal units use common applications and their control sequences tend to be identical from room to room, many unitary or terminal equipment controllers use firmware, which is a software approach that is set to the specific application and cannot be modified, for their programming. Control sequences are usually stored in some type of memory device [e.g., flash read-only memory (FlashROM), erasable programmable read-only memory (EPROM), and electrically erasable programmable read-only memory (EEPROM)] and only set points, PID gains, and various options can be customized by the user. This type of programming tends to increase operational reliability and to reduce controller hardware and installation costs. However, when specifications call for special sequences, fixed-program-type controllers are a real disadvantage. Some vendors provide controllers that allow a mixture of fixed and custom programming, and some offer totally user-programmed units. Controller customization is important when global system optimization is required or when special controller sequences or features are needed. To make the terminal controller an integral part of the EMC system, controllers are usually connected together to form their own communication networks, usually called subLANs, which are connected to larger centralized digital controllers at the air handling unit level. 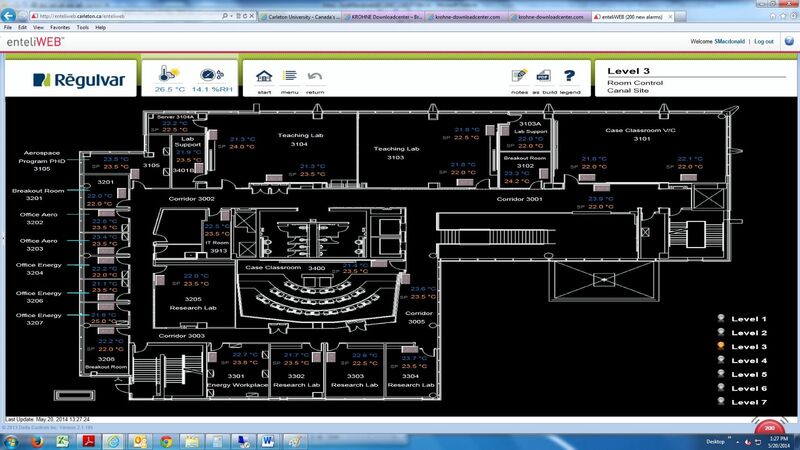 Building technicians can view and adjust room temperatures and other point information. Many system design engineers specify that all of the rooms served by an air handling unit be connected to the air handling unit controller. This way, the rooms and the HVAC unit become a totally integrated control system. Air handling unit set points can be optimally set to the needs of the room served. Controlling room HVAC on the basis of actual room usage can generate considerable additional savings over traditional air handling unit scheduling. Using a standard occupancy sensor as people enter or leave a room can allow the terminal unit controller to automatically switch from the night to the day mode. Night mode set points reduce or increase room temperature to unoccupied set points. When a person enters the space, the occupancy sensor immediately signals the controller to return the system to the day mode setting, and the room quickly returns to occupancy temperature and ventilation rates. As rooms become vacant, the occupancy sensor can switch off the ventilation, heating or cooling and room lighting. A third mode also exists that is straddled between “occupied” and “unoccupied” mode, which is known as “standby mode.” Standby mode is a compromise between the two set points and allows for energy to be saved while the space is not occupied. The difference between standby and unoccupied mode is that the space temperature is not allowed to drift to the threshold of unoccupied mode, which could lead to comfort complaints when occupants use the space again. When occupancy schedules are known in advance, traditional time-of-day schedules can direct the terminal controllers so that the air conditioning or heating can be turned on in advance to bring the room to its normal temperature before occupants arrive. An additional enhancement is the use of occupancy sensors to improve the determination of actual occupancy patterns to activate the building systems only where needed. Studies of occupancy diversity show that the occupancy temperature and ventilation control at the room level can save a significant amount of energy as compared to the simple air handling unit start-stop control and could reduce average annual energy consumption by 30–50 percent. In recent years room condition monitoring has been greatly improved through the addition of cost-effective humidity and carbon dioxide and occupancy control. Most colleges and universities have combinations of centralized chiller plants and packaged chillers or absorbers scattered throughout their campuses. With large chilled water distribution systems, an EMCS is used to control both the central refrigeration equipment and the building chilled water systems. Because campus-wide chilled water distribution systems can be thermally and hydraulically complex, only a campus-wide EMC system is capable of globally controlling and optimizing such a system. With a properly designed and programmed EMC system, all of a building's flow rate, air handling, chilled water coil temperatures, and valve positions can be used as input to the central cooling plant controls to optimize chilled water supply temperature and select the correct number of chillers and pumps needed for any given condition. Building information can also be used to anticipate cooling demands and to allow operators to stay ahead of the cooling needs of a campus. On some campuses, the global EMC system information is used to directly start (or signal the operators to manually start) central cooling plant chilled water pumps and chillers, thus saving hundreds of hours of unnecessary operation and considerable energy expense. In buildings where there are two or more independent chillers, the EMC system control program can decide when the cooling load is great enough to start a second chiller. Some systems also make the decision as to which chiller best meets the particular load. Many systems optimize chilled and condenser water temperatures for compressor head pressure reductions. EMC systems can compare the additional cooling tower fan energy costs in relation to compressor motor load costs and then make the necessary set-point adjustments to minimize energy usage. Utilities base their charges to large customers on a combination of total electricity consumption (kilowatt hours) and the maximum demand (kilowatt demand) or maximum rate of electricity usage in a specified billing period. The utility determines a user's electric demand by continually measuring and then averaging electricity load in kilowatts or megawatts for a selected demand interval (e.g., 15 or 30 minutes) or by a sliding window method, in which the highest average load in a sliding window any time during the day's demand time period is used. The interval that is the largest then becomes the basis for demand charges for the succeeding periods, which can be as long as 11 months. Demand charges are a substantial part of any campus utility budget, and in some campuses, they are as high as 50 percent of the monthly electricity bill. An EMCS can be programmed to limit demand to help avoid unnecessary high-demand charges. Most systems can monitor electricity demand and consumption from a group of meters. With this information, the electrical demand programs resident in central computers or EMC System field controllers forecast or predict the peak demands for each meter interval and calculate electrical loads to shed/reduce the selected loads that will keep the demands below the preset kilowatt demand limits. Demand-shedding sequences can be initialized from either a single “main” meter or from multiple meters with demand information. Typically the demand profiles follow a bell curve where the highest demand occurs during the cooling season. To alter this demand peak on a hot day is challenging as chillers, pumps, and other electrical equipment need to remain off for long periods causing discomforting environmental conditions for occupants. Utility companies often have programs in place with rebates and other incentives to encourage users to shift their demand. Demand monitoring is also a valuable tool to verify the accuracy of billing as a portion of your rate is based on the demand. Fault detection and diagnosis (FDD) is an automated system to address faults related to HVAC equipment and systems. FDD systems are logical programs that work by measuring all of the points in an EMCS, comparing them to what those values should be, and then identifying likely conditions that could be in fault mode. Some of the inputs processed are outdoor air temperatures and mixed, return, and supply air temperatures, damper positioning, end-of-line pressure, relative humidity levels, supply and return water temperatures in heating/cooling coils. Space level sensors and variable air volume (VAV) box control feedback can also be used. FDD systems continuously monitor the EMCS points and associated objects by collecting and sending the information to a secure server where the FDD algorithms are based. As properly tuned FDD system can now diagnose faults that can lead to energy savings and labor savings. For example, if an air handler unit (AHU) is scheduled to run from 7 a.m. to 10 p.m., however, the FDD system indicates that the AHU is actually operating 24 hours day, the additional 9 hours of run time per day would result in substantial energy consumption that may not be noticed for some time. Labor costs can also be saved through the use of an FDD system. An FDD system can identify equipment that has not yet failed but is starting to fail. This would allow a building operator to ensure they have the parts on hand and could potentially change out or repair the equipment before it fails. This could minimize after-hours or emergency service which is charged at a premium of regular daytime service. FDD systems can ensure that HVAC systems are continuously operating at their optimal conditions while at the same time saving the owner money through energy savings and reduced labor savings. As mentioned above, it is not only important to be able to harvest building performance data but also to truly monitor how a building is operating on a daily basis. Measured utility data can be overlaid with the operational building trends to get a clear snapshot of consumption and usage over time. Discrepancies can be identified (for example, lighting usage during unoccupied hours) and adjustments made. 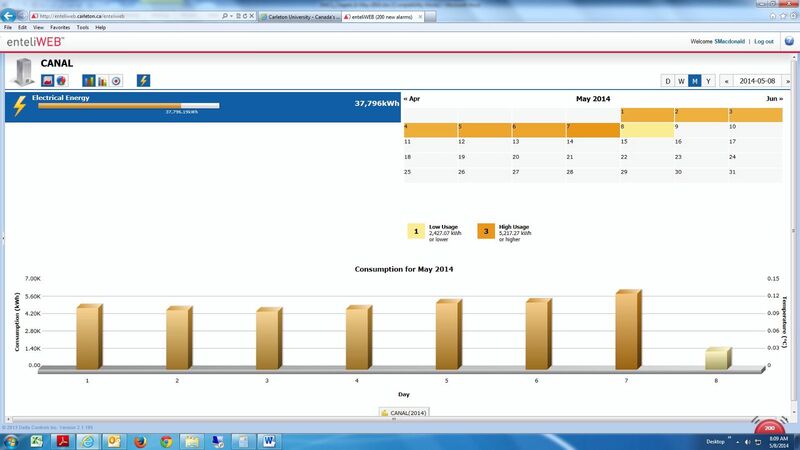 Figure 9 demonstrates an energy dashboard of a building that indicates the consumption and peak loads over a day. Most chilled water metering consists of a primary flow, a sensing device, and two accurate temperature sensors located in the chilled water supply and the return lines entering and leaving the building. Commonly, the primary flow sensor is a paddlewheel-type device, or an orifice plate. Paddlewheels are inexpensive and, if installed correctly and maintained, can be relatively accurate at moderate to high flow rates (>30 fps). To measure chilled water flow, a small plastic wheel designed with a series of "paddles" sticking out from a central hub, much like a paddlewheel boat, is mounted on a stainless steel axle that spins around as water flows past it. A small magnet mounted in the wheel is sensed each time it comes around by a transducer mounted in the body of the insertion device. Electrical pulses from the magnet travel to a frequency to milliamp or voltage transducer, where the frequency is amplified and converted to a signal compatible with the input needed by the DDC controller pulse accumulator or totalizer-type input point. Orifice plates with differential pressure transmitters are frequently used to measure chilled water flow. Ultrasonic flow meters can also be used to measure the flow in a fluid like chilled water. The velocity of a flowing fluid can be determined by measuring the amount of time of ultrasonic passage. As a pulse is propagated and received, the velocity can be calculated. Problems can be encountered if the pulse propagated is not detected by the downstream transducer; this issue can be solved by utilizing a wide-beam system that can overcome beam refraction; this system works better if the liquid has changes to its properties such as its temperature and density. Many campuses use low-cost positive displacement water meters to measure the volume of condensate being generated in a building. These types of meters are usually selected for the highest operating temperature available from a manufacturer (+250A° to 300A°). Their accuracy is usually in the 1 to 5 percent range, but there is a possible loss of condensate upstream of the meter through condensate lost into the air in HVAC humidification and in some cooking applications, or from leaking condensate pump seals or opened drain valves. These problems can make such installations highly inaccurate at times. However, despite this possibility, their low cost and simplicity make this method of steam metering attractive. EMC system inputs from these meters are typically from a low-voltage auxiliary contact device added to the meter dial indicator at the top of the meter. The drawback is that they do not indicate accurate time of use and are subject to improper reading due to leaks. As discussed above, many different types of meters can also be used to measure steam. These include electromagnetic flow meters, vortex meters, orifice meters, etc. It is important that meters are properly sized for the heating load required for the building. If not, inaccurate flow rates can manifest themselves at both the low and high end of the measuring parameters of the meter. It is also important to note that as the properties of steam change over time, such as temperature and pressure, they affect the calculations of the steam usage. Steam meters now have temperature and pressure sensors built in to compensate for these changing conditions to ensure that the most accurate readings are captured. Meters also have digital remote readers that can be installed, so it is not necessary to read a meter from the pipe that it is installed on, but rather a more convenient location such as a nearby wall. Building electric meters can be initially ordered and retrofitted with a pulse contact that closes after a specified number of meter revolutions. This is a simple way to remotely read electric meters. For modern electronic meters, auxiliary outputs or higher level communications such as RS232 or RS485 signals can be ordered. These require the use of gateway products between the EMC system field panel and the meter. They are available from most major control manufacturers. When using the generic DDC controller to integrate several sensors and compute instantaneous demand and totalized consumption over a specified time period, the digital controller software must be carefully written and then rigorously tested to assure total meter end-to-end accuracy. At the basis of every EMCS’s function is a network. The network allows communication between all of the devices to ensure information is shared throughout. To ensure communication is always established, all devices must communicate using the same protocol. The protocol ensures that all communication follows a common set of logic to ensure proper connectivity. Protocols specify several factors such as addressing, data timing, corrupt data, etc. to ensure data is communicated as it was intended. These protocols were first developed by the manufacturers of DDC devices. Most were proprietary protocols and could share information with each other, but not competitor devices with a different proprietary protocol. This scheme of having different proprietary languages operate in a single building or multiple buildings meant that multiple networks had to be run and multiple workstations were needed to monitor and operate the building. This setup was costly and complex for the building owners and operators. Today, most protocols are open protocols. That is, different manufacturers of DDC devices can share data between systems as long as they are using the same open protocol. When installing an EMCS, open protocols are advisable. If you only have one supplier and installer for your EMCS, then open protocols may not apply to you, however, an EMCS is designed to be around for the lifetime of the building. It is a fair assumption to make that your selected provider may have operational changes over that time frame. Your selected provider could fall behind in technology, parts may become obsolete or may be acquired by a firm with a different business philosophy, or their pricing may escalate so that they are no longer an economical choice. Even if you believe that none of the above is applicable to your institution, open systems should still be considered, as there are subcomponents that can be incorporated onto your EMCS through open protocols. Examples are variable frequency drives, power meters, carbon monoxide sensors, indoor air quality sensors, and life safety systems. The three most common open building automation protocols are BACnet (building automation and control networks), MODBus (Modicon Communication Bus), and LonWorks (local operating networks). Standard 90.1: Energy Standard for Buildings (the basis for most energy codes in the country). Standard 55: Thermal Environmental Conditions for Human Occupancy (the comfort standard). Standard 62: Ventilation for Acceptable Indoor Air Quality (the basis for outside air requirements in the building code). ASHRAE also maintains the standard for the EMCS open protocol BACnet, which is Standard 135. BACnet is an American national standard, a European standard, a national standard in more than 30 countries, and an ISO global standard. The protocol is supported and maintained by ASHRAE Standing Standard Project Committee 135. BACnet, the ASHRAE building automation and control networking protocol, has been designed specifically to meet the communication needs of building automation and control systems for applications such as heating, ventilating, and air conditioning control, lighting control, access control, and fire detection systems. The BACnet protocol provides mechanisms by which computerized equipment of arbitrary function may exchange information, regardless of the particular building service it performs. As a result, the BACnet protocol may be used by head-end computers, general-purpose direct digital controllers, and application specific or unitary controllers with equal effect. BACnet is more than just a protocol for communication between control systems; it is a standard system specification that ensures a common design concept between manufacturers. The idea is that a control panel from manufacturer A should be able to talk to one from manufacturer B and understand what the inputs/outputs/set points are in both systems. An analogy is the old pneumatic control systems. Pneumatic control panels from two different manufacturers may have looked very different on the inside—different styles of controllers, relays, switches, and gadgets. However, the signals going between the panels were the same (0–20 psig). If the supply air temperature on control panel B needed to be changed, it was easy to adjust. I knew that the temperature was reading 70?F or 21?C by plugging in anybody’s temperature gauge to the signal. What went on inside of the panel may have been very different, but the signal between them and out to the real world (valves, dampers, etc.) was the same—very open. If you wanted to use a different manufacturer for the next control panel, you could. That is the same basic intent behind BACnet. You are not being held hostage by a proprietary design that only their system will work with. This means that you can use different types of control systems within the same building and they will all be able to communicate. It should be noted that to keep operation simple, it is still good practice to keep systems uniform. However, it does mean that you can use different manufacturers for different subsystems. That is the chiller could be one manufacturer, the air handlers another, and zone control another, and they would all be able to communicate. This makes maintenance and training easier as you only have to carry spare parts for one manufacturer. Having an open communication protocol allows you to choose manufacturers from building to building. As with other open system designs, different suppliers have different advantages and disadvantages. BACnet does not attempt to define how the individual controllers are programmed, just how they talk to one another and share data. Make sure you know how your BACnet system will look and feel for your operators. Do not assume they are all alike. BACnet will continue to evolve and incorporate the latest technologies available to EMCS manufacturers. There are several standing committees in the ASHRAE BACnet organization who review the latest technologies and issues facing the BACnet community. When changes or additions are made to the BACnet standard, there is an open, public review period where any stakeholder can add input and make suggestions to the committee. Once the public review session is over, the revised BACnet standard is published and available to any interested parties. This process ensures that the BACnet standard evolves and stays relevant. Due to its being developed and administered by a nonprofit professional organization, there are no licensing fees or hardware requirements for BACnet systems. Anyone can get the BACnet standard, design a product to work with it, and go to market. As a result, the number of BACnet-based systems and subsystems are constantly growing. This means that building owners will continue to have choices in the future and won’t be held captive by any one manufacturer or hardware supplier—which was the initial reason behind BACnet. BACnet is a communication protocol for building automation that is an open standard that can connect different subsystems such as HVAC, lighting, security, and safety into one integrated system. As it is able to span different components of buildings and provide one foundation for communication, buildings are “smarter,” and building operators can understand how each facet of a building is operating. LON-based systems are made by a number of different manufacturers and are designed to allow them to share data among themselves. The communications protocol used by these devices was also developed by Echelon—LonWorks. This protocol can be used on twisted pair wire, power line carrier, and tunneled on Internet Protocol (IP) networks. Modbus enables communication between many (approximately 240) devices connected to the same network, for example a system that measures temperature and humidity and communicates the results to a computer. Modbus is often used to connect a supervisory computer with a remote terminal unit (RTU) in supervisory control and data acquisition (SCADA) systems. Many of the data types are named from its use in driving relays: A single-bit physical output is called a coil, and a single-bit physical input is called a discrete input or a contact. In many institutions, the EMCS was a stand-alone system that did not share data between buildings and/or sites. Remote access into the EMCS either did not exist or was done through the use of dial-up modems. Local utilities for real-time energy consumption. Weather data for current and forecasted conditions. EMCS alarm monitoring so consultants can acknowledge alarms and examine problems as they happen. Commissioning agents can access data to see if new buildings are operating as designed. As remote access has become more commonplace, EMCS servers have been targets for malicious attacks. These attacks can play havoc with the proper operation of buildings, and sensitive spaces such as laboratories, clean/manufacturing rooms, and animal holding areas can be targeted, resulting in loss of data, downtime for manufacturing equipment, loss of animals, etc. To minimize these threats, the campus IT group should be consulted to discuss the design of the network, network architecture, and network components. Details such as server management should be discussed to ensure that proper updates, upgrades, and any other maintenance is regularly performed. Network security is not just a one-time discussion; ongoing reviews should be scheduled with the IT group to ensure that the proper maintenance is being performed and that security needs are still being met. As we share EMCS information to different resources, we can start to take advantage of real-time utility monitoring for demand-response programs as discussed above. The expanded definition of an intelligent building explores the “building as a system” principle. This monitors all of the components of the building systems combined and evaluates how they react when the parameters are modified. Some of the components involved are building orientation, building architecture, building layout, building envelope, mechanical and electrical systems, building usage and occupancy, and building management. Once it is understood how all of these systems interact and react, the building can be more effectively monitored and operated. To fully understand how a building is being operated and how it is reacting to different environmental conditions, there must be adequate sensor data available. These sensors include thermostats, humidistats, air volume sensors, photocells, occupancy, energy metering, etc. Detailed examination of the data from these sensors can dramatically improve understanding of how the building is actually operating. As new intelligent buildings are put into service, the number of sensors dramatically increases and the resulting data analysis can be overwhelming. New analytical tools are now available to provide analysis and feedback related to building performance. This is where data analytical companies can intervene to collect large amounts of data from the EMCS. Their device is installed on the EMCS network to communicate with all of the controllers and sensors and collect data in real time. The main objective is to reduce energy use and provide fault detection, and when performed on a continual basis, the facility operator has the ability to operate the building in its most efficient state. Once collected, the information is constantly broadcast to a main server. This main server is the pathway for the advanced analytics to be performed and for fault detection of all monitored equipment. When initially installed, an energy engineer would first verify the current sequence of operations of all of the major pieces of HVAC equipment and overlay it with utility data and the data mined from the EMCS. Then sequences would be refined and implemented through the building operator. If complaints arise from occupants, then the sequence of operations would be modified again. This process would be an iterative one which would finally stop once the desired environmental conditions are met with the lowest complaints against the lowest amount of energy being used to accomplish that goal. Analytical tools such as these can be powerful tools for building operators to ensure that both occupants are comfortable and the building owner is realizing the greatest amount of energy savings. In the not so distant future, the following fictional situation in a building could be the norm for how buildings are operated. It is Monday morning at 8 a.m. and students, faculty, staff, and other community members are making their way to the university to start their day whether for study, work, or recreation. Today there is a large event proceeding at the university and the campus will have more than 25 percent of the normal amount of people on campus. As these occupants enter the building you see energy and water use start to spike as computers are powered on and HVAC systems power up to accommodate the increased load. This spike does not warn the building operator though, as the EMCS automatically integrates the university event schedule into its program. This allows the large lecture hall to automatically adjust the proper environmental conditions for the space. There is no need to manually change a schedule or increase airflow and decrease space temperature, as everything is automatically completed. At 11 a.m., the sun rises and reflects off an adjacent building into the hall to temporarily blind occupants for an hour until it passes, but the photocell along the windows senses this increased light and controls the blinds to close until the sun passes. When the sun finally passes, the blinds automatically rise to allow natural light back into the room. At the end of the day when the event is over there is no need to look at scheduling of the HVAC equipment or to turn equipment back to its “normal” operating state, as this is all accomplished dynamically through the suite of sensors and controllers that exist throughout the building. Suddenly an alert e-mails the building facility manager—one of the cooling coils is not receiving enough flow, because a pump is not receiving any chilled water because a valve is closed. This problem is dealt with in real time, as the technician receives an alert on their mobile device. With the EMCS in place, it is not be necessary to depend on occupants to let you know that there is a problem. This proactive strategy not only ensures that building occupants are comfortable, but ensures that HVAC equipment is properly maintained and repaired to ensure that the equipment lasts as long as possible. As the building operator is about to leave for the day he receives a last-minute request to provide utility budgets for the upcoming year. Usually a request of this nature would involve days of scrutinizing data, utility prices, heating and cooling degree days, square footage increases/decreases, and student staff and faculty populations. But as all of this information is collected through the EMCS, a few keystrokes and clicks of the mouse and the report is generated. 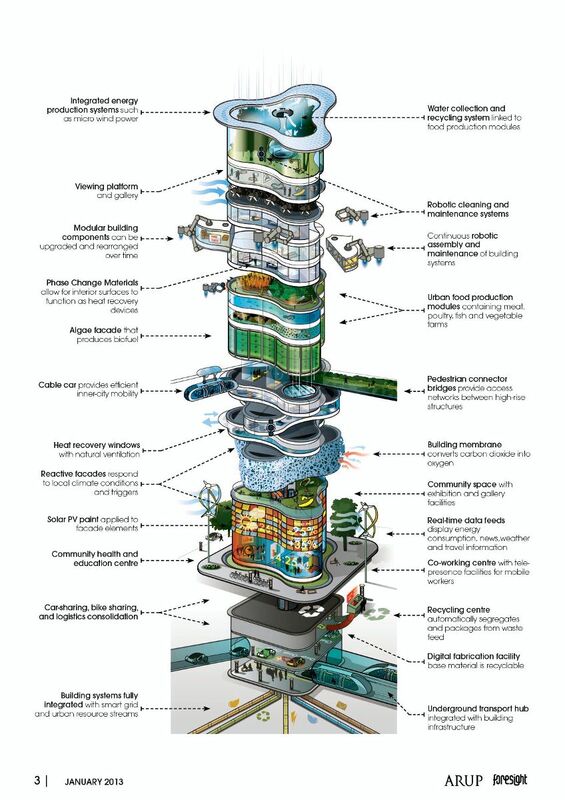 Figure 10 shows what an intelligent building of the future might look like. Used with permission from Arup. Selecting a new EMCS or managing the business relationship with an existing EMCS provider requires careful planning, and the same effort put into the careful selection of an EMCS provider will save your organization aggravation and money in the long-run. The earlier in the design development phase the EMCS supplier is involved, the fewer surprises. Discussing your needs and level of control needed for each building/system/room will facilitate how much your budget needs to be. The EMCS supplier can give your design team budget numbers throughout the design process. This allows the design team to adjust the design as they go instead of waiting until the project is out for bid. The most effective EMCS design should involve multiple design disciplines. Typically, the majority of the impact is upon the mechanical system design. As a result, the mechanical consulting engineer usually carries the EMCS as part of their portfolio. However, in a truly integrated design process, the EMCS will impact the electrical system (for lighting, electrical metering, power requirements, etc.). The design team leader must coordinate the responsibilities across the mechanical and electrical disciplines. Dedicated electrical circuits for EMCS power are made available and are clearly shown on the drawings. Developing a list of controllers and sequence of operation. Interlock wiring requirements for motor starters, freeze stats, smoke detectors, and other safety shutdowns are clearly assigned (usually the responsibility of the BAS contractor) and not double-covered under the multiple sections. Lighting control requirements must be coordinated with the EMCS to ensure that installation requirements are clearly delineated between the electrical contractor and the EMCS contractor. The lighting/HVAC/security systems need to utilize an integrated design approach to get the biggest bang for the buck—for example, using one motion detector for lighting control, HVAC occupied/unoccupied sensing, and security notification. A detailed “point schedule” listing the minimum input/output requirements for each system should be included in the design. The location and address of the system and local controllers. The required sequence of operations. Adequate physical access is required to allow for future maintenance of all EMCS components. This is especially true of zone controls that may be “buried” somewhere above an inaccessible ceiling. The goal is to ensure that the owner’s staff will be able to easily service/maintain the system throughout the lifespan of the facility. The best way to make sure the system will be sustainable from an ongoing operations standpoint is to involve the maintenance team in the design review. As they are the ones who will have to support the system in the long run, it only makes sense that they should review the proposed design before it is too late. Require all available (released by the manufacturer) software upgrades be installed at your site throughout the warranty period. Consider requiring training at the beginning of the warranty period (e.g., 8 hours onsite) and at the end (e.g., another 2 days of 4 hour sessions). You may wish to require emergency response service (2-hour telephone/online response and a 4-hour maximum onsite response time) to warranty calls. Most standard warranties specifically exclude after-hours and holiday labor. You can and probably should override this with your warranty requirements. Yes, it will add to the EMCS contractor’s price, but it will never be less expensive than before the contract is issued. If you don’t have a technical support agreement with the EMCS supplier already, you may wish to include one in the installation contract (usually in the warranty provision). This may allow you to get some of the operations expenses covered by the capital budget, at least during the warranty period. If your organization requires it to be kept separate, then get a separate price for in-warranty service from the EMCS supplier as part of the RFP or tender. When pneumatic control systems were the prominent control source, it was necessary that a comprehensive preventative maintenance program was followed. Air compressors needed to be checked, filter/dryers needed to be changed and inspected, controllers required periodic tuning, and sensors required periodic recalibration. Now with a DDC system and an EMCS bringing it all together, this preventative maintenance program has changed. Pneumatic control system components last much longer than DDC components. DDC controllers will need more maintenance between failures and software updates. However, overall maintenance is improved because of the visibility offered through the DDC system. To maximize benefit, you need to fully leverage the power of the DDC data through the use of a monitoring-based Cx, continuous Cx, or fault detection and diagnostics system. Some specialty sensors like carbon dioxide, carbon monoxide, and refrigerant leak detection sensors will need periodic recalibration. However, you don’t need to be calibrating most standard temperature, humidity, and pressure sensors. In most new EMCS installations, there isn’t a lot of “preventative maintenance” required. However, there are different services where the preventative maintenance budget shall be allocated to services like training, graphic interface reviews/updates, software updates, database backups, offsite data backup storage, remote operator assistance, or backup and consultative services. These are essentially the preventative maintenance for your EMCS. Training for your staff to allow them to get the most out of your system is vital to getting the most return on your investment. Training should be something that you build into your maintenance support agreements with your EMCS supplier. Your staff should receive all of the factory training necessary to fully implement and program the system. In essence, you want to be able to determine your own future and not be 100 percent dependent upon a third party for technical support on your system. It should be expected that the BAS manufacturer or local provider offer significant training and support for your staff. There is a solid body of evidence shows commissioning saves money. A report by Lawrence Berkeley National Laboratory indicated that the median costs for commissioning an existing building was $.30 per square foot; for new construction it was $1.16 per square foot. The resulting whole-building energy savings were 16 percent for an existing building and 13 percent for new construction. This means the median payback period for existing buildings was 1.1 years; 4.2 years for new construction. The report also found significant nonenergy benefits (maintenance, operations, comfort, safety) from commissioning that offset all or part of the commissioning cost. Trend logs are an important diagnostic tool. The EMCS can be set up to trend data that can be evaluated to ensure the building is operating as designed and intended. Trends can be set up at the appropriate interval to ensure that potential problems can be identified and corrected before larger problems are realized. The graphical user interface should be used as a part of the commissioning process. The standard operator graphics can be augmented with additional information that the commissioning agent wants to see. This way all of the information on the system (air handler, chiller, boiler, terminal unit, etc.) can be verified on one screen. If the commissioning agent needs to see how the air handler responds to set-point changes and outside air conditions, those set points and conditions can be displayed on the same graphic. This saves time and aggravation. Automated commissioning routines may be utilized to perform prescribed system checks without the commissioning agent having to sit in front of a screen for hours. This method can help save time for the commissioning agent. For example; the commissioning agent has to verify the operation of 300 VAV boxes in the building. An automated commissioning routine executed by the control system can exercise the VAV box damper (full open, full closed) and record the corresponding airflow readings. If the readings do not correspond with how the damper says it is operating (if it’s slipping, reversed, or not working), a “flag” gets raised for a detailed inspection of that box. This same technique can be applied to reheat coils, valves, etc. The idea is to use the power of the control system to find problems without having to sit and watch it for hours on end. Automated commissioning reports are not a standard feature on all BAS. However, on many advanced systems, they are. It is a great feature to have the system report on all of the calibration. Healthy indoor environmental environments are important to improving productivity, reducing absenteeism, and improving turnover rates. 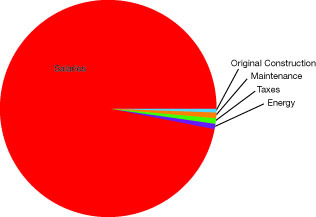 Figure 11 depicts the life cycle building costs and shows that salaries compose more than 90 percent of building costs. If the EMCS and your staff’s services can boost productivity (by improving comfort, reducing absenteeism and turnover) by even 1 percent, the resultant savings would be more than the total energy bill. Used with permission from ASHRAE. The figure above demonstrates that the primary objective of the building system is to provide a comfortable and productive indoor environment. There may be many strategies that will save energy dollars, but do not provide a comfortable environment for building occupants. Examples include cycling fans on/off during occupied times, dimming the lights too fast, or unreasonable temperature set points. What is the facility’s energy use so far this month, this year? How does it compare to last year? How does it compare with other buildings on your campus (some schools foster competition among individual buildings (dorms, colleges, etc.)? What is your real-time electrical demand (could include gas, steam, and oil)? What is your current carbon footprint, perhaps showing your savings versus a specific goal (tons of CO2, equivalent number of trees, number of cars off the road, etc.)? What is the facility’s water consumption versus design standard (how much are you saving)? How much money are you saving (or not saving) versus a design standard, or average building or other buildings on your campus? Additionally, other environmental conditions, like weather data, weather forecasts, etc. can be added to the dashboard. Dashboards can be part of an information kiosk, an educational display, or they can be used for remote reporting of your sustainability efforts (perhaps linked to your campus website). The dashboard concept is also being extended to serve as an executive summary report for facilities executives. They may not want all of the details, but they do want to see how each building is doing on campus, and how the overall campus is doing. If you are in charge of producing the energy conservation results for your organization, an energy-focused dashboard can be extremely useful in pinpointing successes or problem areas at a glance. A good strategy is to include the baseline energy data and goals in the dashboard versus the actual energy performance of the facility. Once information is in the system, web hosting allows you to share it with whomever you need to. 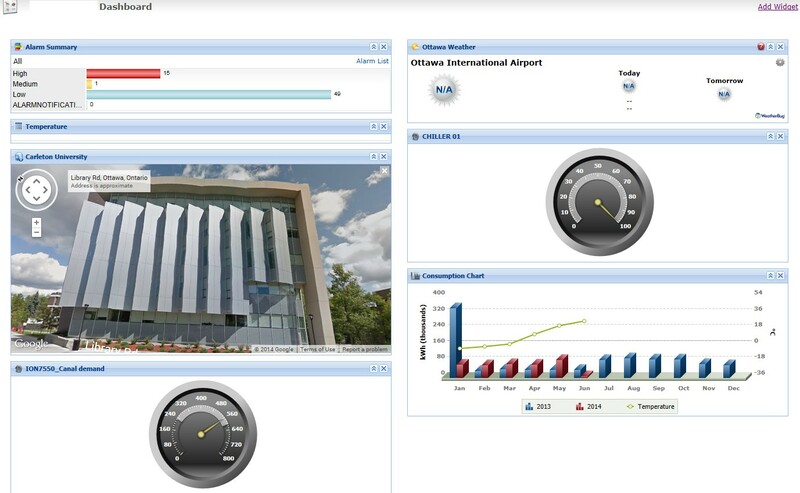 Figure 12 shows an example of a building dashboard. BAS systems have supported some wireless features in the past primarily for the remote operator interfaces. Whether it was a Wi-Fi enabled laptop or a smartphone with a web browser, many systems support this wireless approach. This is a practical feature and works great for technicians, facilities maintenance personnel, and any location where a wired operator interface is not practical, for example a temporary portable. Wireless sensors are a great solution in spaces where the building conditions do not permit a wired sensor to be installed: for instance, in a portable classroom that needs to be connected to the EMCS, or where an expensive finish (marble) is not allowed to be drilled through, or where designated substances such as asbestos exist and you can’t disturb the finish. Wireless temperature sensors have been around for a while, as have simple on/off sensors (like door switches, fan status, filter switches). They tend to be more expensive than their wired counterparts, require some maintenance (some are battery powered), and can’t provide the instantaneous/continuous signals that wired sensors can. These are some of the disadvantages of wireless sensors. However, a great deal of progress has been made on wireless sensors. There are standards being issued for the use of wireless data transmission by BACnet (Zigbee radios) and others. Some sensors are able to communicate without the use of battery power by harvesting energy from the lights, vibration, or air motion. Having the individual controllers (room thermostats, fan controllers, central plants) communicate wirelessly with one another is the final stage in making the system completely “wireless.” This is more difficult than sensor or even remote workstations as the amount of data moving through the network is larger and the timing is critical. Newer developments include the use of mesh networks, which use each controller as a repeater and allow the network to find multiple paths for communication. This makes the network more reliable and more forgiving of interference caused by other signals, the structure itself, and furniture and fixtures. As these technologies evolve and become more reliable, less expensive, and more available, the potential savings in installation costs will make them very attractive. Computerized controls are an integral part of operating a campus to ensure that environmental comfort is achieved while consuming the lowest amount of energy to accomplish that goal. An EMCS is only as good as the equipment it controls and the building operators who maintain said equipment. As computing technology continues to advance, even more information will be integrated into EMCSs, permitting them to respond to building demands even more dynamically. This real-time identification of operational issues will allow building owners to have less downtime on HVAC equipment, reduce maintenance and replacement costs, and identify greater energy savings. The use of an open protocol for communication, such as BACnet, is also an important choice that allows equipment from multiple vendors be used in one system. However, it is important to understand that an EMCS is only a tool, needs to be managed effectively, and still requires dedicated professionals to properly understand the inputs and outputs of the system, the networking , and of course the thermodynamics and HVAC equipment. Comfort is the goal of a properly implemented, maintained, and operated EMCS. Energy savings, reduced maintenance, and operator savings are secondary benefits of a properly maintained EMCS. 1 “Building Commissioning: A Golden Opportunity for Reducing Energy Costs and Greenhouse-Gas Emissions,” 2009. ASHRAE Standard 135-2004, “BACnet A Data Communication Protocol for Building Automation and Control Networks,” 2004, American Society of Heating, Refrigerating and Air-Conditioning Engineers, Inc. ISSN 1041-2336. “Lon Works,” http://en.wikipedia.org/wiki/LonWorks, retrieved March 1, 2014.